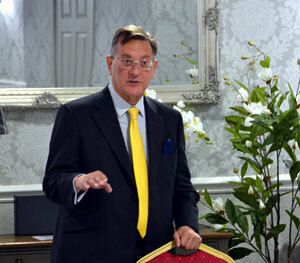 Perfect Points heard a tale of a remarkable Mason, who was involved in both World Wars, at their April meeting. The Chorley based Masonic research group aims to deliver talks by its own members, this meeting was an example of that taking place. Frank Wilkinson, Past Assistant Provincial Grand Master and long-standing Perfect Points member was the speaker on this occasion with his talk about the First World War and in particular Freemason Bill Stone. Also, in attendance were past chairmen of the research group, John Robson and Dave Harrison, as well as Chorley Group Vice Chairman Peter Allen and Leigh Group Chairman Jonathon Heaton. Leigh Group members are becoming interested in what is being done by Perfect Points, so Jonathon attended to get the ‘heads up’ and what Perfect Points get up to. The research group chairman, Gary Smith opened the proceedings with a warm welcome to all in attendance and set the stage for the evening’s talk, which was to follow on from the hugely successful November meeting held to recognise 100 years since the end of the First World War. Gary informed the brethren that following the October annual general meeting it is his intention to step down as Chairman of Perfect Points. This is due to his promotion at Provincial Grand Lodge, as a Provincial Deputy Grand Director of Ceremonies of the Province of West Lancashire. He thanked the entire past and present executives who have worked with him of over the past five years. He also thanked the president Peter Lockett, who is also Chorley Group Chairman as well as thanking John Robson, Dave Harrison and all of the members for their support. The evening continued with some war time grub! As is the tradition at Perfect Points the supper is themed to the talk, so it was a hearty portion of ‘Saturday’ meat pie followed by ‘Charlotte’ bread and butter pudding, representing the meals typically eaten by soldiers in the trenches. On this occasion served in the more luxurious surroundings of Westhoughton’s Brookfield Hall. Frank took centre stage and commenced his poignant talk with some background information regarding the spark that ignited the chain of events leading to the start of the First World War. He also discussed the ‘Flanders Field’ poem and how it came about, which included a moving rendition of the poem its self. Delivered with sincerity and all from memory, he then went on to the circumstances that lead him to become involved with the remarkable Mason, Bill Stone. Pictured from left to right, are: Jonathon Heaton, Gary Smith and Peter Allen. Bill was a Mason of 75 years standing and it was in Frank’s role working with the Masonic Samaritan Fund (MSF), he had learned about Bill’s amazing and long life, when he became a beneficiary of one of the MSF grants. Bill had served in both World Wars and was initiated into Freemasonry between them. It was Bill who was asked to read the Flanders’s Field poem at his local Cenotaph. We learnt of Bill’s bravery and courage. When he joined the Royal Navy in the First World War, he would have known that many of those before him had perished in the cause. Frank had informed the meeting that over 10,000,000 soldiers were killed and another 8,000,000 were missing and assumed to be dead. In one battle alone 20,000 lost their lives on the first day during the battle of the Somme. Bill survived both wars and lived on to the age of 108 and thus the oldest man to have served in both wars. He lived the later days of his life in a Masonic care home and was assisted by Masonic charities to have an operation performed to remove cataracts which, given his senior years the NHS would be unlikely to fund. It was the Masonic charity grant that allowed Bill to have the operation without which this war veteran would be unable to perform this duty of reading the Flanders’s Field poem. This is a good example of how Masonic charity improves the quality of the lives of many people. Sadly Bill died only a few short months after delivering his reading. More can be found regarding this remarkable mason Bill by searching ‘Bill Stone’ on Wikipedia. Following the talk, Frank was thanked by Gary and the audience with acclamation, which lead to that other great tradition seen at Perfect Points meetings; ‘the free raffle’. 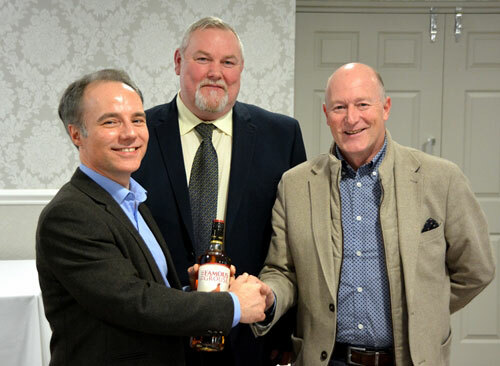 This time it was Peter Allen who was the lucky winner of the bottle of fine whisky. Gary announced the date of the next meeting which will take place at Chorley on Friday 25 October 2019. At this meeting Allan Shields, Perfect Points Vice Chairman and current President of the Manchester Association for Masonic Research, will present ‘Soap Powder and Freemasonry’ which looks at the life of Lord Leverhulme and in particular his Masonic activity. An invitation to Leigh Group members was given to Jonathon, there will be soap involved, as well as that free raffle so why not join in? All Masons are most welcome to attend Perfect Points meetings. mamr.co.uk and http://www.chorleymasonicgroup.org.uk will both have information regarding the next meeting. The brethren hear about a ‘Remarkable Mason’. Article by Gary Smith and Allan Shields.